Joe was born and raised in San Clemente, California. If there is anything to know about San Clemente, besides home of the Western White House during the Nixon presidency, it is the laid-back lifestyle of South Orange County. Joe personifies that lifestyle every day in his work as a professional photographer. Having Joe as your photographer, you are getting a skilled and talented craftsman with more than 20 years experience who has photographed over 600 weddings. With an easy-going and calming approach to keep everyone comfortable, Joe’s goal is to incorporate natural poses while capturing sharp images. Joe has created a following and style all of his own. 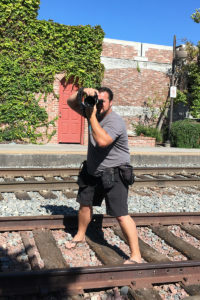 As a wedding, portrait, food and lifestyle photographer based in historic downtown San Juan Capistrano, I enjoy the challenge of each photo shoot and love what I do. I started shooting weddings shortly after high school and have honed my skills over the past 20 years. One of the biggest compliments I get from brides is “After spending my wedding day with you (Joe), I feel like you could be my brother.” I get told that often. Enjoy my images and don’t forget to call me to set up your bridal consultation or even if you just have a photography question, I am always here to help. Received his first camera when he was 12. Sold his first photos, some slides, to the County of Orange at 15 years of age. As a senior in high school, had 3 out of 5 classes in photography, and was a photographer for the school paper. Studied photography at the prestigious Colorado Institute of Art on the University of Denver campus. Graduated with a A.S. in Commercial Photography. Joe writes comedy and is working up the courage to do his first stand-up set. His favorite vacation is fishing in the Sierras near Bridgeport with his sons. Member of the Honorable Order of E Clampus Vitus, ECV64.